Alfred and Elizabeth McCune stopped keeping track of expenses after the costs for their “simple” bungalow on Capitol Hill reached $500,000. They imported roof tiles from Holland , rare white satin-grained mahogany from South America , and a room-sized mirror from Germany . The ceiling murals and decorative borders alone took an artist from New York two years to finish. 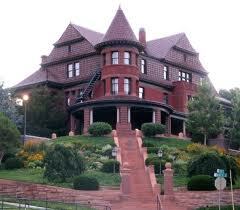 Completed in 1901 and restored in 2001, the McCune Mansion remains a Utah showplace. Spend an hour touring the mansion from the first floor's octagonal reception room to the third floor's glittering ballroom. The Venetian marble bathroom alone is worth the tour! Tours are open to the general public. Tours of the McCune Mansion are only arranged upon request. Tours are available on week days, during the daytime hours only. These tours cost $3 per person and must be scheduled at least two weeks in advance. We require groups of at least ten and up to 25 people to schedule tours. Contact Kathy Nielsen at (801) 533-0858 extension 104 to arrange your tour. ohhhh fun! I wanna go!! Who else wants to go? I do, I do! Sounds like fun doesn't it? !